Puiforcat cutlery constitutes an essential part of L’Osier’s spirit of hospitality. When it relocated to Ginza’s Namiki-dori in 1999, L’Osier switched to procuring silverware only from Puiforcat, the long-established French silversmith brand. L’Osier selected a total of 900 pieces of cutlery, as well as platters, sugar pots and other tableware, invariably of an artistic quality and rarity which today would make them museum pieces out of the reach of most. L’Osier’s treasured Puiforcat collection, of a size unrivalled by any restaurant in Japan, has to this day been carefully and lovingly maintained, and is served to customers daily along with the cuisine of executive chef Olivier Chaignon. At L’Osier, new staff members are thoroughly initiated into the art of looking after silverware. Twice a day, after the lunch and dinner service, each piece is carefully polished with a soft cloth; this is an essential daily routine. According to Uchibori, by polishing each piece so that it is in perfect condition at all times, employees learn firsthand the weight and value of the silverware item, which in turn positively affects their outlook and attitude toward service. Puiforcat Brand Overview : Established in 1820 by Emile Puiforcat in the Marais district of Paris, known for its many orfèvres (gold and silver workshops), Puiforcat is a venerated French silverware maison widely reputed to represent the pinnacle of contemporary silverware. 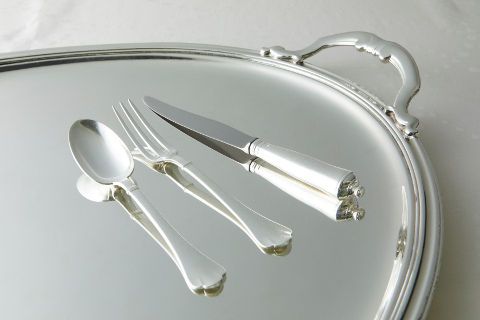 Its cutlery, painstakingly made by artisans from highest-grade silver, is used at dinner parties at the Élysée Palace, the official residence of the President of France. An Hermès group company since 1993, the company to this day continues to uphold its craftsmanship and tradition. Among the dishes sought after by our customers, from early spring to early summer, we receive requests in particular upon booking for à la carte dishes which use “Hokkaido Kegani” (horsehair crab). For example, the “Hokkaido Kegani Crab Crustacea Custard”, available from around the end of March to May, is such a dish. 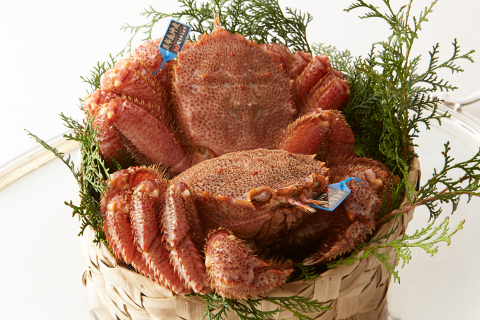 It has plump textured and sweet crab meat mounted upon a crustacea custard with asparagus ice cream contained within. Between the sourness of the crustacean cream filled turnip, the crunchy texture of the green asparagus, the contrast between the different temperatures of the custard and ice cream; the stunning presence of the flavor of the horsehair crab is exceptional, says executive chef Olivier Chaignon. In his trip Chaignon visited his preferred port for horsehair crab from where he has had crabs sent alive since he was first fascinated by its rich flavor – Saruru, in Okoppe-cho, Monbetsu-gun, on the northern island of Hokkaido. The seas around Saruru are abundant in plankton and it is a port which boasts plentiful seafood from the Sea of Okhotsk. Chaignon visited at the end of March, a peak period for fishing the rare high-grade horsehair crab “umiake kegani” just when the drift ice has left. This is also when time has passed since molting (i.e., the body is hard and the meat is firmly packed in) and the highest rated rank “katagani” can be caught. L'Osier’s speciality horsehair crab: delivered to our kitchens still alive from the fishing port of Saruru in Okoppe-cho. So as not to lose the extremely delicate texture and sweetness, Chaignon boils it slowly together with white wine and vegetables to express without sparing the splendor of the supple meat and the plump, well-rounded flavor. Our à la carte dishes, including Crab Crustacea Custard, that use various techniques to present the charm of Hokkaido Kegani horsehair crab can be enjoyed together with seasonal ingredients up until August. It was love at first sight. Since the spring of 2017, Hakkaisan salmon has enthralled executive chef Olivier Chaignon. Despite its name, the fish is actually a type of rainbow trout; however, as one might imagine, it is raised very differently from its more ordinary cousins. Fresh springwater from the sacred mountain Hakkaisan, renowned for its fine sake, is drawn to provide an environment which is infinitely close to untouched nature. Here, the Hakkaisan salmon are allowed to take their time, 50% longer than ordinary farmed trout, to grow to a large size. Because they are raised exclusively on the mineral-rich springwater straight from Hakkaisan, and given plenty of time to grow at a low water temperature, Hakkaisan salmon are free from the distinctive odor of freshwater fish and have no excess fat. They also have no eggs or sperm, which means their meat contains the entirety of their goodness and flavor. “They are lower in fat compared to salmon,” says Chaignon, “and their fat is fresh and clean. The well toned flesh is smooth to the palate. I cannot say enough about the wonderful texture that overwhelms your mouth the instant you take one bite.” As his enthusiasm demonstrates, Hakkaisan salmon is an ingredient which captures the imagination of professionals skilled in French contemporary cuisine. To draw attention to its beautiful colors and exquisite texture, Hakkaisan salmon fillet is rolled tightly and cooked slowly at low temperature (mi cuit). After heating carefully, just to the point where the flesh dissolves smoothly in the mouth, the rolled fillet is cut and placed atop cream of leeks bursting with earthy flavor, and garnished with lemon fruit and zest. To the side, a generous portion of Ossetra caviar boasts a richness and flavor suggesting hazelnuts. The ultimate harmony with Hakkaisan salmon, which is free of excess oil, culminates instantaneously into a world of euphoric delight. The condiment is also extraordinary, inspired by the Zen temples of Kyoto and modeled after Japanese stone gardens. The whites and yolks of eggs are likened to stones, adorned with capers, beet-tinted onions, and ciboulettes, each capped with a single bead of Ossetra caviar to embody the precisely ordered world of Zen. 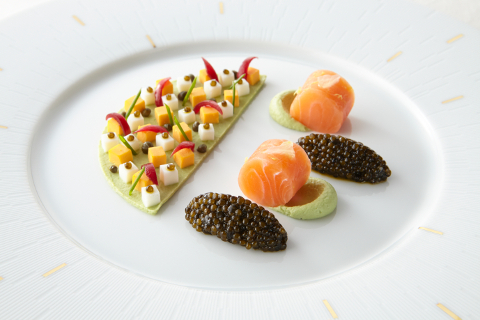 Wrap the Hakkaisan salmon, caviar, leeks, and condiment in the accompanying blinis and experience a new encounter with the aroma of buckwheat. Flavor and richness, aroma, tartness, bitterness, and sweetness... The micro-level fusion in your mouth constructs a delectable pentagon of tastes for you to enjoy on your journey to the world of Hakkaisan Salmon, the wondrous food which captured the heart of Chaignon. Matsusaka, Omi, and Kobe are the three top Japanese brands of beef which have driven the upsurge in premium Wagyu since the 1990s. In addition to these big-name brands, there are Yonezawa and Hida beef, as well as Shorthorn in Iwate and Hokkaido. In recent years, grass-fed New Zealand beef and the French Charolais beef are also gaining popularity on the wave of the red meat boom. Out of this multitude of choices, the brand which captured the heart of our Executive Chef, Olivier Chaignon, was Kumamoto Aka-ushi Beef, raised in the foothills of Mount Aso. Roughly in the center of Kyushu, Mount Aso boasts one of the largest calderas in the world and a lush natural environment with clear water, pristine air, and green countryside in which the Kumamoto Aka-ushi is raised in stress-free surroundings. The appeal of this beef is its delicate marbling free of excess fat, and its exquisite tenderness underpinned by moderate firmness. The more it is chewed, the more sweetness and umami (taste) burst in your mouth. It has both the meaty aroma and rich flavor of beef and the full-bodied flavor of Wagyu. Chef Chaignon, enraptured by the wonderful taste of Aka-ushi beef, made a personal visit to a father-son team of cattle farmers, Eiki and Yasutaka Saito, in Kikuchi City, Kumamoto, which is known for its fine cattle. The passion of the Saitos gave Chef Chaignon an even deeper appreciation for this superb food. The stalls are cleaned and serviced on a 24-hour basis to keep the animals free from stress and discomfort. They are fed hay and rice straw to develop their cud-chewing function, then raised lovingly on a diet consisting mainly of local Kumamoto-grown grains. While demand for this beef grows every year thanks to the rise in health consciousness and popularity of red meat, the increase in production has fallen short of expectations in the aftermath of the earthquake. 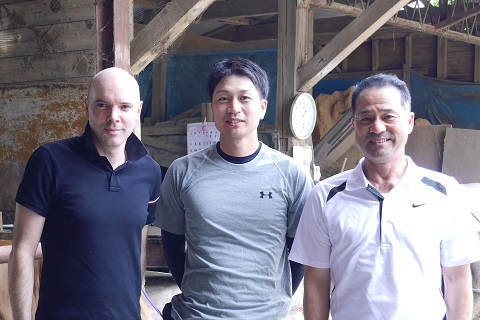 ※The photo on the preceding page shows (from right to left): Cattle farmers Eiki & Yasutaka Saito (father & son), and Olivier Chaignon. Abalone slice cooked in butter is one of the dishes that have captured the hearts of many patrons as a specialty cooked by Executive Chef Olivier Chaignon since 2013, when L’Osier was renewed and opened. This dish becomes available as the appetizer for a course dinner only when “the very best Japanese black abalone” of the year is delivered. In response to inquiries from clients who cannot “wait to taste it again,” it is a highly popular item added to the a la carte menu. 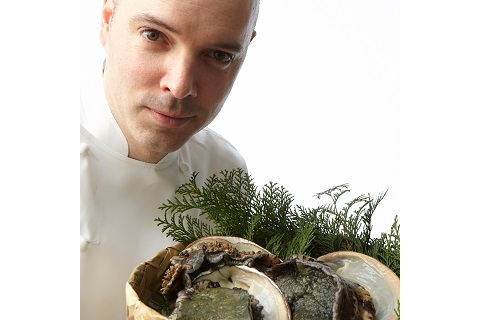 The encounter between Olivier and the Japanese black abalone occurred at a grilled-dish restaurant he says he visited shortly after arriving in Japan. The abalone grilled on a hot iron plate in an instant impressed him with quite a different texture and taste from small abalones landed in small quantities in Bretagne, France. Its texture and taste caused a sensational impact on his senses like he had never experienced before. The “black abalone of Japan’s Boshu district” that is highlighted at this time boasts of by far the best quality among all abalones gathered in Japan. It is a really rare ingredient, weighing 500-600 grams a piece, including the shell. It goes on sale in a limited market only between May 1 and September 15, when the Chikura area in the southern Boso region, renowned as home to the black abalone, opens the season of female professional divers collecting abalones. The piece as heavy as 500-600 grams, as mentioned, changes hands at an extraordinarily high price even in the local fishing village as something that requires as long as 10 years to grow up to that size. Once shipped out, the rare ingredient draws buyers scrambling for this treasure. At this time of the year that suits its landing, the black abalone collects nutrients actively toward the egg-laying period in October. It absorbs minerals from kelp drifting in abundant quantities over the seabed and grows up into a high-quality thick body. Abalones generally slim down when heated. But the “black abalone of Japan’s Boshu district” stays plump even after being heated. It maintains adequate elasticity yet remains moist and soft, one of its defining features. Here comes Olivier’s representative specialty: abalone slice cooked in butter flavored with shiso flower creamy wheat and seaweed, and a sea urchin broth sauce. It is one of the dishes that the chef wants his clients to enjoy at this time of the year, when this select ingredient finally comes by. To maximize the delicate taste of the “black abalone of Japan’s Boshu district,” it is steamed in a typical Japanese cooking method at the first stage by using horse radish and Japanese sake. It is subsequently mixed with jus de coquillages, or bodily fluids from shells, in the state of pochee. Thanks to the combination with jelly lichen in bulgur (parched/crushed wheat) risotto underneath, and the sea urchin broth sauce based on shell fluids, the dish is enhanced with the smell of the sea and Umami taste, as well as profound flavors and textures, all elements interacting and overlapping mutually inside the mouth. As a result, abundant and plump gifts from the sea unfold in an in-depth marriage with each bite. Olivier Chaignon’s deep thoughts of the “black abalone of Japan’s Boshu district” are found in the following statement.